This deck took me to Rank 15 in Masters during Chapter 17, and is a revision of an earlier deck that I used to Rank 150ish from just past Diamond I. At heart this is a Xenan deck, but a splash of Primal helps to fill in a few gaps and open up some powerful combos. 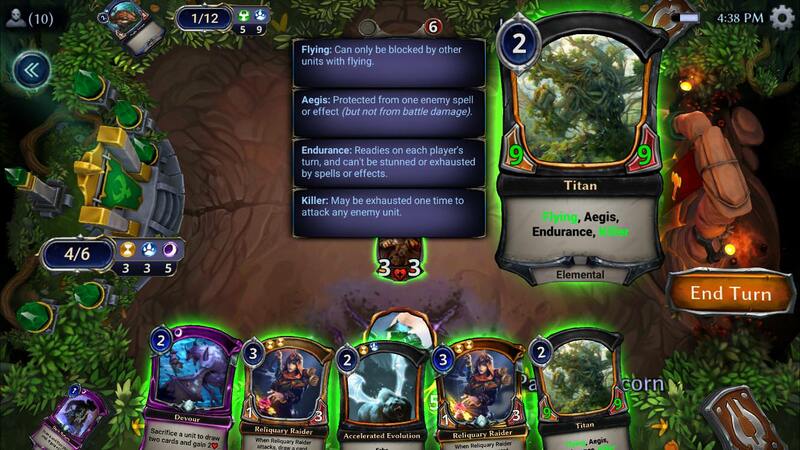 With a little luck, Call the Ancients combined with Dark Return makes it possible to find yourself holding a 2-cost multi-faction 9/9 Flying Elemental Titan with Endurance, Aegis, and Killer. If you don't happen to hit one of your Ancient Elemental Titans, Black-Sky Harbinger makes another excellent target for both Xenan Initiation and Accelerated Evolution. The same can be said earlier in the game for Ayan, the Abductor and Reliquary Raider. Each of these units do more for you than just deal damage when attacking and/or defending, and with Dark Return you get double the benefits of your Time and Primal buff spells. Madness, Devour, Teleport, and Xenan Initiation make up the Xenan Madness package detailed in a previous write-up. Each are included x4 here in the absence of any kill spells, which means you must rely on combos - but the upside is that these cards each serve double duty. Along with Beckoning Lumen and Temple Scribe, Devour is a fairly reliable source of card draw. And when not abducting enemies as part of a Madness combo, Teleport protects your own units as well as returning Killers to your hand for another strike. Late game, one or two copies of Madness can also serve as a powerful finisher when your opponent is at low health and doesn't have enough defenders to block their own strongest unit(s). PS - For anyone who may be wondering, this is why I play Teleport instead of Equivocate. How would you rework this deck for the new expansion and current meta. I really want to craft Call the Ancients, and have it in a relevant deck! Good question! I've been wanting to update this deck for FoA but I just haven't had time lately. Hoping to get to it soon. As for Call the Ancients: It is one of my favorite cards. Most people will also tell you It is not very consistent or competitive. My take is that whether or not you craft it should depend on a couple of things: How much shiftstone do you have? And what is more important to you for your personal collection: owning the cards you want or owning the cards that are the most competitive? I bought the deck and Im loving it so far but still getting a feel for it and loosing a lot lol. What does the ideal opening hand look like? How many power? What are your best and worst match ups? Glad you are loving it, and hope you are are getting more of a feel for it now. As for ideal opening hand - the earlier you Call the Ancients, the sooner you can start drawing them. So I like to see Call the Ancients plus Seat of Wisdom and an undepleted sigil whenever possible. It feels unusual (but nice) as a slower midrange deck to have a solid play on turn 1. Beyond that you are looking for Temple Scribe, Vara's Favor, Ayan and Raider. It is nice to be holding a power source for each color, but you want to prioritize Time and Shadow. Unless you have Call the Ancients, you won't need Primal until at least turn 3 - and even then only if you have a unit to buff with Accelerated Evolution. Otherwise you can go without Blue until you are ready to play Harbinger. Added 1 Azindel's Gift instead of 1Teleport for late against combo and spell control decks. I think about Scheme, but instead of what? And what shell i do with spam decks? Gift will certainly help you in the match-ups that you mentioned. What could i replace the ancients with until i craft them? Was everyone playing unitless control when you made top 15 with this deck? I feel like I'm close to 0% with this against midrange decks. Yeah, the meta was definitely different then - and I was facing a lot of control decks. However, truly unitless control is not a particularly great matchup for this deck due to all the Madness and Killer effects. 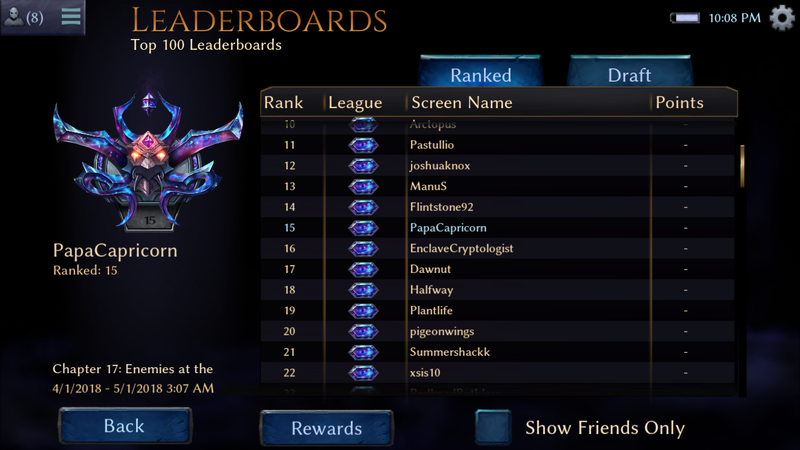 I haven't played it as much during the current season, but it doesn't surprise me that this list would not do well against a midrange heavy meta. If I were using it right now I'd probably try to find room for some more hard removal. Digging it so far. Teleport is wonderful with madness. I had been looking for an ancients deck too. Hope it continues to perform well for you, Hellcat. This deck is really good, but I feel like it has too many moving pieces that don't do much on their own if you're missing one of them. From my short experience with the deck, I feel the deck could use a little bit of removal, but I'm not sure what to cut exactly. FWIW, I found that the more I played with the cards, the more I learned ways to make those moving parts work on their own. For example: popping Aegis on an enemy unit with Accelerated Evolution, or executing a blow-out using Teleport to remove one of two double-blockers. These plays may seem obvious to people who have more experience than I do, but they definitely helped me to squeeze out a few extra wins. Really digging the deck. I don't have the CTAs, so I just put in the 2 ICBs and 2 Setbacks and the deck performs quite well. Recurring a killer BSH is just insanity! I def agree for this deck that Teleport is the card to use. I love the option to follow up Madness with it so I can recast the stolen unit. How this deck stands against Aggro decks? Vara's Favor and Ayan, the Abductor do very well against early aggression, so as long as you draw them you should be ok. Later-game, Black-Sky Harbinger helps a lot with go-wide strategies. I actually found aggressive midrange decks like Argenport to actually be much more problematic than straight-up aggro. Ok, but what about Skycrag Aggro? If you get lucky with an early Elemental Titan from Call the Ancients, Skycrag has literally no single answer for this. And again, Ayan, the Abductor helps if you are able to draw him. One the other hand, if your Skycraggro opponent has favorable draws there is not much you can do - and that is true of any deck really. Skycrag Aggro may be one of the weaker matchups for this deck in a Best of One setting. In a tournament or Best of 3 setting you bring in Annihilate, Banish and Devastating Setback from your sideboard and your odds against Skycrag and other aggressive strategies go way up.